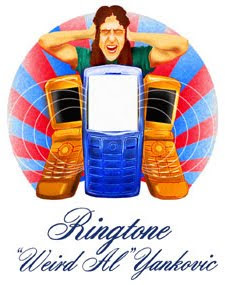 Home » comedy , humor , internet leaks , music , music video , queen , ringtone , weird al yankovic » "Weird Al" Yankovic imitates the inimitable Queen with "Ringtone"! "Weird Al" Yankovic imitates the inimitable Queen with "Ringtone"! Yes, I'm up way early (or is that way late?) awaiting a new song by "Weird Al" Yankovic. But can ya blame me? Especially since Weird Al has bestowed upon us a better summer than we deserve with his "Internet Leaks" collection. A short while ago the fourth and final song from the set was released: "Ringtone". It's a Queen-style anthem celebrating/condemning cellular phone ringtones (duh!). And as always, it's uproariously funny! Can this Al guy make a song about anything or what? Here's the video for "Ringtone" on YouTube, directed by Josh Faure-Brac and Dustin McLean of Current TV's SuperNews. And on the video's page you can find links where you can purchase the "Ringtone" song or the "Ringtone" video from various online outlets like iTunes. Or you can purchase both and put more coin in Al's pocket (as sound an investment as anything these days). And if you haven't purchased any of the "Internet Leaks" collection yet (though Lord only knows why) you can buy the whole shebang at iTunes with one lump sum. Or, perish in flames. It's your choice. But not really.